For the first day at the Summit this year, I spent half my time in a Pre-Conference session with Idera as an outgoing Idera Ace. The session include a 45 minute presentation for me on a Customer Use-Case. The second half of the day was spent in #SQLPASS Community sessions. The Customer Use-Case included screen captures of real-world diagnosis using Idera products. Diagnosis Manager provided most of the screens. 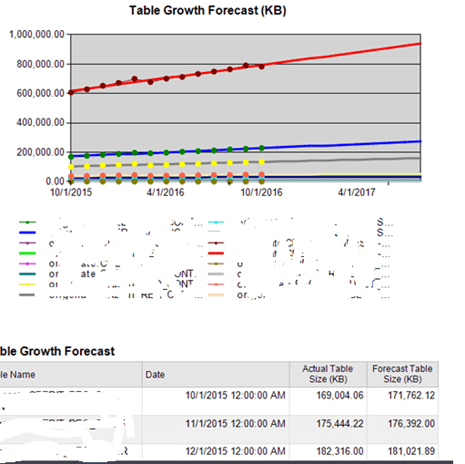 I was able to show the forecasting reports for data file and table usage/growth. We were able to show a large table that indexes were occupying lots of space and investigated the Index Usage through Glenn Berry scripts on a historical level. Removing some large include indexes help alleviate the table growth in storage size. The other slides were about Alerts/EMails, User T-SQL History, BI Manager and Free Tools like SQL Check and SQL Fragmentation Analyzer. The Community sessions were for #SQLSaturday and User Group/Virtual Chapters. The SQLSaturday session was a full house with many comments and questions. Money and Sponsorship was the hot topic. Growth is still being encouraged, but overall the session had a lot of good points with many thanks to such a great community event system. At the end, an emotional Karla talked about the end to her five reign as PASS Community leader for PASS. What a wonderful ending to the session!!! I won’t show any pictures of her crying (or Grant crying). The User Group and Virtual Chapter session were a lot about speakers than money or sponsorship. Truly amazed at the turn out and range of areas represented. I wonder how many User Groups use remote speakers and how often? Interesting discussion about getting a Microsoft TAM or related MS employee to help sponsor or host monthly meeting. You do not pay them but it helps them in their reviews/bonuses. Ryan Adam announces new features in SQLPass hosted user group pages. There will be an option to send out event notifications for email, twitter, Facebook, LinkedIn, Matchup and other social media at one place, not manually doing many. Cheers from the crowd!!! The evening end with a bite to eat at Welcome Reception and visiting with new and old friends, too many to list.